Pinterest, Instagram - and the expectations you then begin to have - can be your worst enemy. Its true, and you know it. It can affect everyone differently, whether with regards to their yard, parenting techniques, meals, or home design. 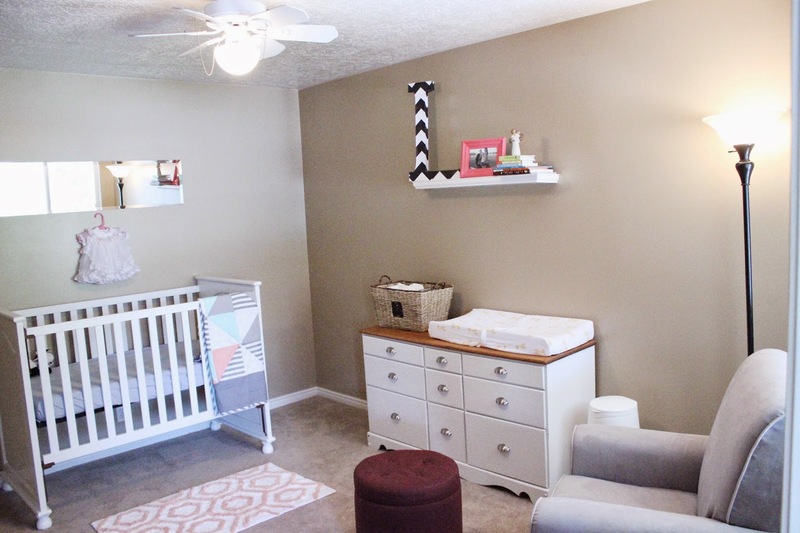 In regards to motherhood, Pinterest and Instagram make us (or at least me) feel that in order to become a mother, we are required to have a nursery, and that it must be more elaborate than all the rooms of the rest of your home - combined! I have expensive taste and like a lot of us, a more limited wallet. As much as I want my daughter's room to be absolutely perfect, I also want to not feel bad when she doesn't sleep in it much because she ended up in our room, or when I realize that she will not have one single memory of this place. Or when she poops and barfs all over it. 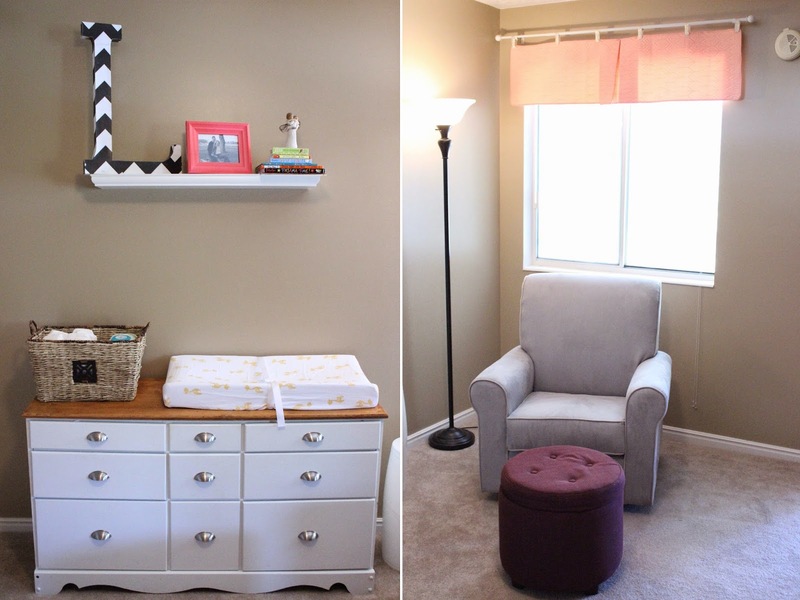 A nursery is much more for the mother than it is for the baby. Think about it. All that happens in there is sleeping, diaper changes, and nursing (which can all technically occur anywhere). While that may sound like a newborn's whole life, what do you really need in order to accomplish those tasks? A place to sleep, a place to change them, and breasts. So why all this pressure for the world's most beautiful and elaborate space? That's not to say you can't create an elaborate space on a low budget. Just because you're on a budget doesn't mean it has to look like it, does it? And you know, many of you may be able to afford the best money can buy. Sweet, go for it! I just had to be a little more creative. Obviously I still wanted a space for my precious baby. And I wanted it to be cute, clean and happy. But I also wanted to look at it and see my baby, not all the expensive stuff I accumulated to surround her. My original design would have been ultra simple, but also expensive, and since I decided to quit working so I could stay home with my baby, I didn't feel justified in spending an arm and a leg on her room (or going into debt). Luckily, I was immeasurably blessed by others in order to create this room so inexpensively. My friends, at showers in Idaho and Washington, and my family really helped with this. So thank you all! Dresser: We already owned this. We got it over two years ago from DI so to make it match her room I just stripped the top and oiled it with teak oil from a previous project, then painted the rest white and added new hardware (which I got cheap from Amazon). The hardware cost about 20 bucks, and I got 10 of those pulls. Oh, and while we are talking about the dresser, just a word to other about-to-be-new-moms: If you are planning on having a shower, don't buy any clothes! You will likely get plenty. I have spent about $40 total (most of which occurred yesterday at a thrift store, and are for when she is older) on clothes and her dresser is full. You can always buy clothes after a shower to fill in the gaps of anything you may still need. Unless you are ultra picky about what your child will wear when they born and pooping and spitting on everything, you don't need to go spend a fortune on clothes. Basket: We already owned this. I think my mom originally got it from TJMaxx almost four years ago to use for my wedding, and then gave it to me. All the diapers and wipes in it were gifts. Also, if having a shower, don't stock up on diapers and wipes until after. You'll likely get lots of these too, and then you can fill in the gaps. Also, unless you have a brand preference, a friend helped me discover a good place to get cheap diapers is Babies 'R Us. Their store brand is only 13 cents a diaper (size 1) at normal price. They have great sales and you can often end up getting them for 7 cents a piece. Makes you not feel so bad about throwing them in the trash. I know Diapers.com and Amazon Mom (which I am also a part of) are also great places too, as you can get the brand you want at a great price. Amazon Mom is only worth it to me because we already are Amazon Prime members because of Kelly's iPhone repair business. His supplier sells through Amazon so its worth it for his business to pay for the membership to get all his parts. Since we are already paying for it, it makes Amazon Mom seem kind of obvious. Plus, they ship right to your house and you don't have to go to the store! Diaper Genie: It was my friend's, but her husband didn't like it so she gave it to me! Glider: I found this at Target (part of the Simmons Augusta collection). Actually my mom did - thanks mom! She knew the only one I had found that I really liked so far was over 1300 dollars, so when she found this one (and was pretty sure I would like it) for 300 she called me right then while she was sitting in it! Mom's are the best. Also, I added this to my baby registry so that when I got my completion coupon in the mail I could order it for 15% off, making it $250. $60, reduced to $19) and then I had a Cartwheel coupon that brought it to a grand total of $15. Shelf: We already owned it. It was originally on clearance from Home Depot, I believe. All the books on it were gifts, and we already had that picture and frame. The "L" Kelly made me for Valentines day actually, but when we found out we were having a girl and then picked a name, we decided it would go in her room. The Willow Tree Angel/Baby was a gift from my mother. Lamp: Already owned it, and it was originally purchased a year a half ago from Bed Bath and Beyond with a gift card we got for Christmas. Mirror: Already owned it. When we moved into our new place here, there was already a full length mirror attached to the door of our walk-in closet, so we used our mirror and turned it sideways and hung it above the crib to add light to the room. Quilt: Made by my sister in law Meredith. She's amazing! And the peach in the quilt was the inspiration for the peach in the rug and the valence. This room cost me $362 dollars. One of the best things to do when decorating on a tight budget is to write down the purpose and function of the rom. What do you want out of the space? List the general feeling, and also specific items you would like in there. Then think about what you already have and how you could make it work. It won't be like the item in your dreams, but it will work and be basically free! By updating furniture with paint and/or hardware, and using mirrors, shelves, light fixtures, etc., that I already owned, I saved a ton of money on this room. Also, make a baby registry. I thought this was stupid but was told to do it just for the completion coupon at the end. I felt dumb compiling a list of things I wanted for the baby as if I expected people to actually buy them for me. I put the glider on there, for a goodness sakes! I felt like an entitled teenager. But it was awesome, because I didn't actually have any expectation for people to buy me stuff off of there, so when they did, it was just a happy surprise! Plus, you get a coupon in the mail to use on anything left on your registry after your shower (you can have a registry even if you don't have shower). The coupon can be used in store and online. So I saved a ton on my stroller, carseat, and glider by using this. And--an extra bonus to it being affordable means that you can feel justified to splurge on a particular item. Just decide what item matters most to you, whether it be your glider, crib, diaper bag, rug, etc. You don't feel bad splurging on one item when you kept costs so low on everything else. Great details. A few questions? What is a diaper genie, and where is it? Also, you should blog about your diaper bag. I love what you came up with compared wit what you were going to do and why you didn't. Love you.